This topic over on TMP makes me wonder why so much distain is aimed at the lowly LARPer, sure it’s a strange hobby, and it’s quite hard for people to understand what the hell is it all about and such like. But this is coming from a site that promotes miniature wargaming! It seems kind of like the bullied kid at school taking a pop at another geeky kid in the playground! I’m pretty sure that if we were to trace a map of evolution of the hobbies, I am sure that there would be related strands that cross over in the family tree. 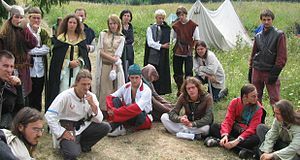 Besides, most people I know who LARP, are actually avid wargamers, RPGers, Re-enactors, and the like, but from the outside we all look the same to untrained eyes. Sure, it isn’t for everyone, but until you “get it” you’ll never see the delights of the hobby, just the same as roleplaying games with your mates, or being a general, commanding an army of tiny little men. There’s also a stereotype of LARPers, which is just that, a stereotype. Much like that of wargaming which likens them to unwashed, beardy types that are devoid of female attention. Lets just be clear about this folks, it’s easy to be ignorant and fear what you can’t understand. The original post in the topic was instigated by the article on the beeb site here: http://www.bbc.co.uk/news/magazine-23877430 about LARP going a bit more mainstream, which after years, is about time to be honest. I’m not asking for any of you to like LARP if you really don’t, but just don’t be ignorant about it. Go on, share a bit of love….